(Second viewing, on DVD, June 2009): With the critical and commercial success of Christopher Nolan’s Batman Begins and The Dark Knight, it’s becoming easier to forget about Tim Burton’s reinvention of the character, before it slid once again in franchise-killing high camp during the Joel Schumacher years. And that’s a shame, because despite some increasingly dated aspects, Batman still keeps an operatic grandeur that resonates even today. The story is thin and eighties-fashion still peeks through the self-conscious blend of historical references, but the entire film remains intriguing. Health Ledger may have taken over the Joker’s look, but Jack Nicholson’s take on the character remains magnetic. Only an underwhelming finale falters visibly: While everyone remembers the Batman/Joker showdown in the streets of Gotham, fewer will recall the following sequence taking place in a cathedral. Two decades after the film’s release, the special edition DVD can afford to be candid about the film’s rushed production, last-minute producer-driven script changes and casting choices. Alas, director Burton’s commentary track could have benefited from judicious editing: His “you know?”s start grating early on and never fade away. (Third viewing, On Cable TV, June 2016) I hadn’t watched Batman in more than ten years, but another look was more than warranted given rapid evolution of superhero movies since then. Tim Burton’s Batman turns out to be a significant step in the evolution of Batman’s movie portrayal from sixties silliness to Nolan’s grimmer portrayal. It’s certainly trying to be more serious, but it can’t completely manage it. It doesn’t help that Burton’s vision for his characters (and particularly the joker) is so colourful and exuberant: it’s tough to keep a straight face at what Jack Nicholson pulls off in his completely unrestrained performance. Otherwise, it’s fascinating to see in here the seeds of the modern superhero blockbuster, albeit with pre-digital effects, restrained cinematography and somewhat more silliness. 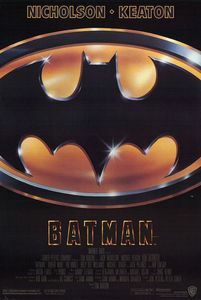 (Not included in the movie, but far more important, are the media tie-in and marketing effort surrounding the film, which I remember more than the movie itself) Michael Keaton is better than anyone may remember as Bruce Wayne/Batman, while Kim Basinger is spectacular as Vicki Vale. The ending is a bit dull (the Joker shooting down the batwing is memorable, but the subsequent cathedral sequence isn’t), but there are enough good scenes along the way to make it worthwhile. It’s probably impossible to overstate Batman’s impact on the modern blockbuster industry, but there’s actually a worthwhile film underneath the hype.